After several days of climbing, the time trialists are allowed to shine. The final individual time trial is almost completely flat, with long straight stretches connected by wide bends where speeds won’t drop. The final section in the city is slightly more technical, but still very fast. Expect average speeds to be around 30mph, and for big men to come out on top. 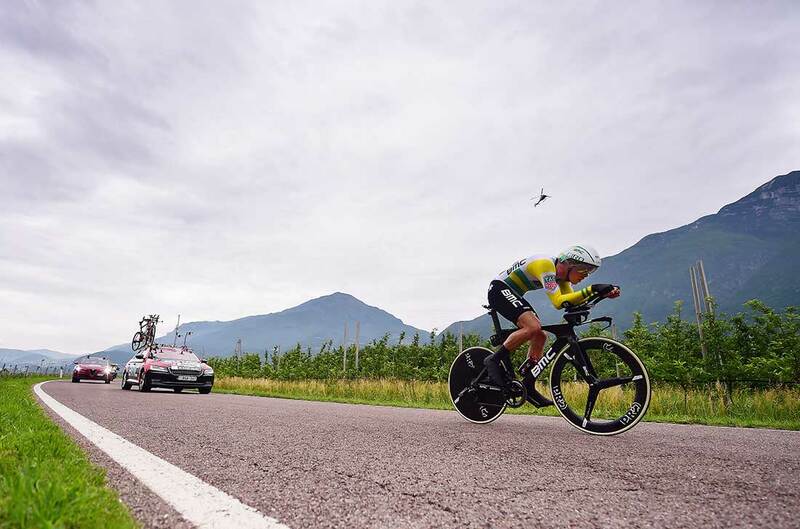 After coming up short in the Giro d’Italia’s opening time trial in Jerusalem, Rohan Dennis (BMC Racing) came correct Tuesday, winning the stage 16 time trial in Trento. Simon Yates (Mitchelton-Scott) defended his overall lead despite facing world time trial champion Tom Dumoulin (Sunweb). “I wanted to come here and win a stage, and I was hoping for Israel to be that stage but this stage was also a big target,” said Dennis. Former world TT champ Tony Martin (Katusha-Alpecin) came in second, 14 seconds behind Dennis’s winning time of 40 minutes on the 34.2km course. Dumoulin was third on the day, 22 seconds behind. Martin set the fastest time early and with intermittent rain showers, it seemed like he might keep his lead until the end. However, the Australian TT champ Dennis, starting 11th from last in the order, delivered a brilliant performance to win the day. His effort moved him up to sixth overall. Among the other GC riders, Chris Froome (Sky) and Domenico Pozzovivo (Bahrain-Merida) both had strong rides. Froome moved up to fourth overall and the Italian Pozzovivo maintained his third-place standing, 3:11 behind Yates but just 39 seconds ahead of Froome. On the other hand, Thibaut Pinot (Groupama-FDJ) had a disappointing time trial, falling from fourth overall to fifth, now 4:19 behind Yates. Wearing the pink leader’s jersey, Yates left the start gate last and rode consistently on the flat course, a time trial that perhaps didn’t suit the slight climber. At the first time check, he was about 20 seconds slower than Dumoulin. His pace fell off considerably by the second check, where he was 48 seconds down. By the finish, he’d lost 1:15 to the Dutchman — far better than even he expected. 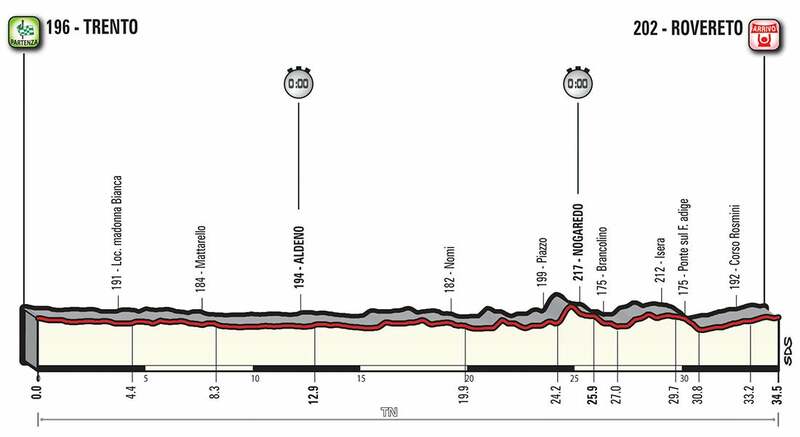 Wednesday’s 155km run from Riva del Garda to Iseo will be one last respite for the GC riders before the Giro heads into the mountains for stages 18, 19, and 20.